Today marks the 71st anniversary of the allied invasion of Europe on June 6, 1944. The 1962 film The Longest Day tells the story of many soldiers and civilians who participated in D-Day, including Pvt. John Steele (above), a paratrooper who is played by Red Buttons in one of the movie's most memorable sequences. The all-star World War II drama The Longest Day (1962) is a comprehensive chronicle of the Allied invasion of the Normandy coast, which began during the early morning hours of June 6, 1944. The film was based on Cornelius Ryan's 1959 nonfiction account of D-Day, and the movie portrays many of the real-life participants on both the Allied and Axis sides. One of The Longest Day's best sequences features comedian Red Buttons playing Pvt. John Steele, a paratrooper with the 82nd Airborne Division who parachuted into a small French village before dawn. Here's a clip of Buttons reenacting Steele's harrowing ordeal (the person who put up the clip superimposed pictures of the real soldiers). Steele was born Nov. 29, 1912, in Metropolis, Ill., to Mississippi riverboat captain John Steele and his wife, Josephine. Steele volunteered for the army shortly before the United States entered World War II. Two of his brothers, Norman and James, would also serve their country: Norman was killed in action in Germany and James served with the Marines in the Pacific. Steele volunteered for the elite 82nd Airborne Division. He participated in the North African campaign and broke his leg during a jump into Sicily. Red Buttons portrays Pvt. John Steele in The Longest Day (1962). Steele recovered just in time for D-Day. 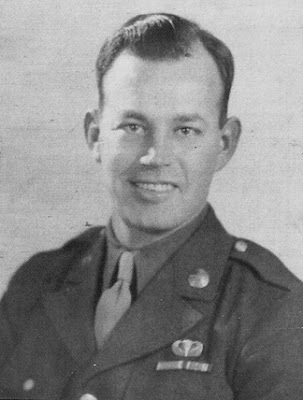 He and the other members of the 505th Parachute Infantry Regiment had the misfortune to land in the small village of Sainte Mere-Eglise in the early morning hours of June 6. The village was usually deserted at 1 a.m., but a stray bomb caused a large fire in a house just east of the town square. The Germans soldiers garrisoned nearby were organizing a bucket brigade when Steele and his fellow soldiers began jumping into Sainte Mere-Eglise. 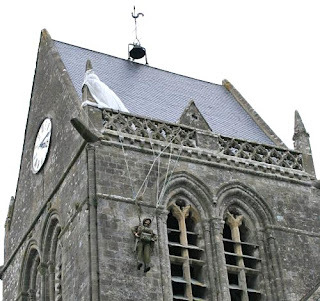 Most of the soldiers were mowed down by German gunfire when they hit the ground, but Steele's parachute caught on the village church's bell tower. Steele tried to free himself, but he dropped his knife, so he was forced to dangle helplessly for several hours until two German soldiers climbed up and cut him down. A statue of Pvt. 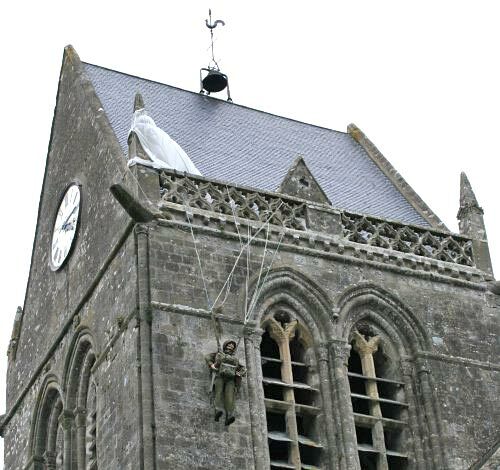 John Steele and his parachute adorn the church bell tower in Sainte Mere-Eglise. Steele somehow managed to escape from the German first aid camp where he was being treated for minor injuries ( it seems that Private Steele possessed nerves of steel). He made one more jump into the Netherlands before returning home in September 1945. Steele received a bronze star and two purple hearts for his valiant service to his country. 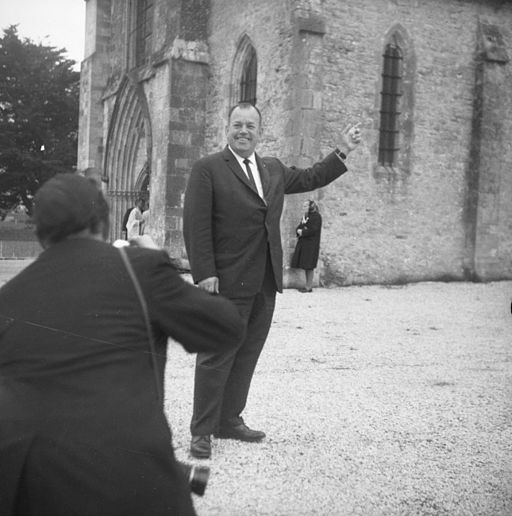 John Steele in 1964 pointing to the bell tower where he spent several memorable hours on the night of June 6, 1944. After the war, Steele became an accountant and lived with his wife, Verma, and daughter, Martha, in Wrightsville Beach, N.C. He did return to Sainte Mere-Eglise for the 20th anniversary of D-Day in 1964, telling The New York Times, "I'd like to see those people again, and I'd like to look at that steeple from the ground up." The citizens of Sainte Mere-Eglise still remember Steele today. He is featured in a stained glass window in the church and a replica of Steele and his parachute still hang from the bell tower (you can see it in this clip below). Steele died from cancer on May 16, 1969. He is buried in the Masonic Cemetery in Metropolis. The Longest Day is available for streaming on Netflix. Also, DIRECTV subscribers can view the film on demand for free. The Longest Day is also available on DVD. Very interesting. The memorials in the church are very touching. Thanks! It's really nice that the people of Sainte Mere-Eglise still honor Private Steele and his comrades.